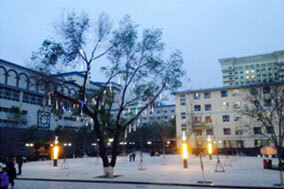 Xinjiang Medical University (XMU) (新疆医科大学) ئۇنىۋېرسىتېت‎,ULY: Shinjang Tibbiy Universitet), formerly the Xinjiang Medical america.html, is a medical university in Ürümqi, the capital of theXinjiang Uyghur Autonomous Region of the People's Republic of China. It was ratified by the National Ministry of Education in 1998 and entitled by Jiang Zemin. The curriculum places a particular emphasis on medicine, management and linguistics, with the university facilitating 25 specialties for undergraduate students and 17 specialties for academic education. Over 50,000 students have been educated at XMU and in 2010, 13,100 students were enrolled at the university, with 5,405 people employed in teaching positions. 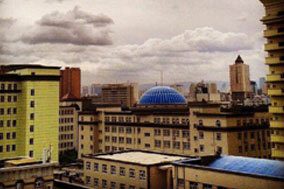 XMU is situated at the base of Carp Hill in Northeast Ürümqi. XMU was founded by incorporating the Traditional Chinese Medicine america.html of Xinjiang Medical University with the Xinjiang Medical america.html. Prior to incorporation, Xinjiang Medical america.html was amongst 156 key projects aided by the former Soviet Union during the First Five-year Plan period and began recruiting new students in 1956. During its sixty years of existence, XMU has received attention from a number of national and international leaders, including Chinese Communist Party officials and other provincial and urban figures across China. XMU approved by the Chinese Ministry of Education in 1998, XJMU has officially developed into a large and comprehensive medical university for teaching, treatment, and expert scientific research.